Traditional dentistry focuses on preventing, diagnosing and treating dental diseases, such as gum disease or tooth decay. Cosmetic dentistry focuses on improving the aesthetics of your smile. Whereas traditional dentistry addresses essential dental health concerns, cosmetic dentistry tends to be considered elective even though it can also have restorative benefits or may be used to improve the function of your teeth or gums. White fillings that closely match the natural tooth color may be used to replace old silver fillings or to repair areas of damage or decay. Inlays and onlays can repair larger areas of damage and may be considered a conservative alternative to traditional dental crowns. Dental veneers or Lumineers may be used to cover teeth for a flawless, even finish. Dental implants can be used to restore missing teeth and provide a firm anchor for a dental crown or other restoration. Teeth whitening, which is one of the most popular procedures in cosmetic dentistry today, can create a whiter, brighter smile by removing many years’ worth of stains. 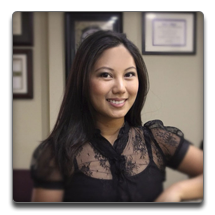 Our cosmetic dentist in Torrance CA can help you explore your options and choose the best treatment or treatments for your situation. If you suffer from extensive damage, decay or other concerns, our cosmetic dentist in Torrance CA may recommend a smile makeover or full-mouth reconstruction. A comprehensive evaluation of your smile and imaging techniques can allow you to see your smile’s transformation so that you and our dentist can determine which adjustments are necessary. A smile makeover may use one or more cosmetic procedures, such as teeth whitening, dental veneers and dental implants, to give your smile a boost and restore damaged or decayed teeth. A full-mouth reconstruction is designed to address serious functional and aesthetic concerns. Your bite, gums and bone structure may need to be corrected, and such aesthetic concerns as stained or chipped teeth can be addressed during a full-mouth reconstruction. Our cosmetic dentist in Torrance CA can provide you with many options and a comprehensive solution to all your smile concerns. Give us a call today to learn more or to schedule a consultation.